Exploitation of peatlands for fuel has been under way in Ireland for 400 years. Today traditional turf cutting, mechanical turf cutting and industrial peat extraction have accounted for a staggering loss of 47% of the original area of peatlands in Ireland. This represents over half a million hectares of land. It concerns two peatland types in particular – raised bogs and blanket bogs. In terms of nature conservation, concern was expressed initially over the rapid rate of habitat destruction caused by the peat industry which was supported and funded by Government. For example in 1946, Bord na Móna, the state owned peat production company was set-up and in a relatively short period of time has been responsible for the development of 80,000ha of both raised and blanket bog. Bord na Móna are the dominant peat producers in Ireland harvesting 4 million tonnes per annum. Other privately owned companies set-up in the 20th century are industrially extracting peat from designated and non-designated peatland sites. Based on estimates of volumes harvested by private peat producers it may be inferred that a probable total of 100,00ha is being utilised for peat harvesting (Reilly and Riordan, 2007). In addition to the peat used in power generation a further 1.2 to 1.5 million tonnes is burned in either sod or briquette form. This is virtually all for domestic use (Reilly and Riordan, 2007). With the introduction of the EU Habitats Directive, the government began to negotiate with the peat industry, particularly those businesses that were operating on designated sites. By 1999, agreements were made to cease industrial extraction on Special Areas of Conservation (SACs). Bord na Móna’s interest in all designated bogs were acquired by the National Parks and Wildlife Service (NPWS), costing approximately €23 million for 7,000ha of land including 4,000ha uncut peatland within SACs. These negotiations were successful because of the low number of companies involved, the availability of funding and the willingness of the companies to avail of compensation. In relation to private turf cutting, which involves tens of thousands of individuals in 128 designated sites around the country, the government introduced the “Cessation of Turf Cutting Scheme” in 1999. Under the voluntary scheme, domestic cutters were given 10 years notice to cease cutting turf and make new arrangements for their fuel supply. The 10 years notice or derogation, was given in light of the social and economic impacts immediate cessation of turf cutting would have had. The first derogation applied to 32 raised bog SACs designated in 1999, with cessation of turf cutting in 2009. The 10 year derogation for the remaining 21 raised bog SACs designated in 2002 or thereafter is planned to be implemented in 2012, with the cessation of all turf cutting on these sites. The cessation of turf cutting on the 75 designated raised bog NHAs is planned to be implemented in 2014. The government are presently forming an inter-departmental working group with the aim of successfully implementing the cessation of turf cutting scheme. Over ¤23 million has been paid in compensation to turbary rights holders under this scheme and it is estimated that up to €250 million will be needed to compensate all remaining turbary rights holders. The cessation of turf cutting does not apply to blanket bog SACs and NHAs at the moment, except on blanket bog sites where turf cutting is found to be seriously affecting the conservation value of the site. A series of compensation packages were offered to private turf cutters. This included the purchase of bog or the purchase of turbary rights; or an annual payment for ten years or the offer of another turf plot in the area and a once-off disturbance payment. By the end of 2001 over ¤4 million was spent on this scheme involving 5% of turbary rights holders. In 2003 domestic cutting was ongoing on 117 of the 139 designated bogs (Douglas et al, 2008). Under the 1999 Farm Agreement those who opted to continue cutting were expected to do so by acquiring a permit from the NPWS, which specifies the way that turf will be cut annually until 2008. Permit’s were to be given for turf cutting on raised bog SACs and NHAs where it is deemed that turf cutting was not having a significant impact on the conservation status of the site (Swan, pers. comm. 2008). However, this control system was never implemented throughout the country. Turbary or the right of private individuals to cut turf for domestic use has been carried on for centuries in rural areas of Ireland. Since the 15th century traditional turbary has been responsible for the loss of 470,247ha of raised and blanket bogs or 40% of the original peatland area in the Republic of Ireland. Today turf cutting affects every raised bog of conservation importance in Ireland involving the drainage, burning and ultimately the removal of the peat resource. In the past the surface of the bog was mostly cut away by hand using the traditional turf spade or sleán, however, more recently mechanised extraction is the norm with the use of chain cutter, digger, sausage, hopper and milling machines. The mechanisation of the process of peat extraction since the 1990’s has had serious impacts on the peatlands of conservation importance and on peatland resources generally in the wider countryside. In the past traditional hand cutting of turf took generations to remove the peat bog but the use of machinery has greatly accelerated this process. More peat is being harvested over a wider area of bog by contractors. This has altered the meaning of “turbary rights” in the traditional sense to permit semi-industrial extraction. Semi-industrial commercial extraction is an abuse of turbary rights and as such is an activity that needs to be regulated through the planning process. In the public eye people equate the cessation of turf cutting being applicable to every peatland area of Ireland, regardless of their current conservation designation. They see the cessation of turf cutting as an EU driven action. They do not believe that turf cutting has an adverse impact on peatland habitats and biodiversity in comparison with industrial peat extraction. There is an urgent need to educate turf cutters on the damaging effects of turf cutting. In addition turf is the only source of fuel used in some homes for heating and cooking and the cutting and footing of turf is a traditional activity handed down through the generations. The table shows the timetable for the cessation of turf cutting on designated sites in Ireland. Please note that this only relates to Raised Bog Habitats. Download a pdf of the peatlands of conservation importance subject to the cessation of turf cutting 2009. This source of this information is from www.npws.ie. 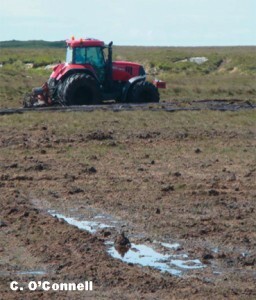 Since the introduction of the cessation of turf cutting scheme in 1999, researchers in NPWS began a systematic programme of monitoring of all raised bogs designated as NHAs and SACs (136 sites) including the monitoring of vegetation communities, habitat extent, habitat quality, impacts on habitat and management. A series of reports have been compiled, the most important being the Raised Bog Monitoring Report 2004-2005 (Fernandez et al, 2005) and the Active Raised Bog Habitat (7110) Conservation Status Assessment (NPWS, 2007a). A series of assessments of the impact of turf cutting specifically on raised bogs have also been completed (see Fernandez et al, 2006). A summary of the status of peatland habitats produced by NPWS for the EU under Article 17 of the Habitats Directive in 2006 showed that 10 years after the introduction of the Habitats Directive, raised bog and blanket bog habitat are not in favourable conservation status (NPWS 2007a and 2007b). This means that the range of the habitat and area of the habitat within its range of occurrence is unstable and/or decreasing. NPWS estimated that in 2008 there was only 1,945ha of the peat forming, priority habitat Active Raised Bog 7110*, the remainder of raised bog habitat has dried out due to drainage, cutting and burning. Between 1995 and 2005 the area of active raised bog had decreased by over 35%. While turf cutting continues, it is reasonable to expect that the area of active raised bog will continue to decrease. This decline will in fact continue for several decades after cutting and drainage ceases until the remaining uncut bog area reaches a new hydrological equilibrium and subsidence ceases (Douglas et al, 2008). At present complete cessation of turf cutting has occurred on only one raised bog SAC (Killyconny Bog SAC 006) as a direct result of the cessation of turf cutting scheme. Clearly the cessation of turf cutting scheme is ineffective at tackling the issue of the destruction of active raised bog and a new approach is needed by the Irish Government. Conflicts between turf cutting (turbary) and conservation are greatest where peat extraction is occurring on sites that are of conservation value (NHAs and SACs). This activity is not compatible with protecting biodiversity as it removes the habitat. Conflicts with regard to turbary use of peatlands also arise in relation to this practice in the wider countryside. The continued exploitation of peat resources for fuel in certain circumstances is not compatible with achieving favourable peatland conservation status, for example, within the range of occurrence of the raised bog peatland type. If favourable conservation status is to be achieved, it will be necessary to cease turf cutting and begin a programme of restoration of cutover bog habitat that is currently undesignated. In addition, turf cutting may have to cease if landscape management policies in relation to climate change, the conservation of carbon sinks within peatlands, biodiversity conservation and the inter-connectivity between sites of conservation importance are to be achieved. The BOGLAND project set up by the EPA aims to deliver in 2009 a protocol for the future management of Irish peatlands, which will drive new policies in relation to the sustainable use of peat resources within the wider countryside. The commercial extraction of moss peat has now ceased on all SACs. However, the demand for moss peat in horticulture for the hobby and professional markets means that intact, undesignated sites are under threat. The 2009 decision by An Bord Pleanála not to grant permission for the extraction of moss peat from the undesignated raised bog Kilballyskea Bog in Co. Offaly, on the grounds that the site contained the Annex I habitat 7120 Degraded raised bogs still capable of natural regeneration, acknowledges that undesignated, intact peatlands represent a nationally and globally threatened habitat and not a resource for moss peat. Moss peat extraction methods involve clearance of the surface vegetation and site drainage. Irrespective of the method employed, the site drainage and subsequent surface layer removal cause irreversible damage to the ecosystem (Anonymous, 2008b). The management objectives of these intact undesignated peatlands should be the restoration of their carbon sequestration function and the enhancement of biodiversity. Bord na Móna is the largest producer of horticultural peat in Ireland with six other medium sized companies: Bulrush, Clover, Erin, Harte, Klasmann-Deilmanna and Westland. There are up to 30 small producers with numerous (estimated up to 300) small semi-agricultural producers that supply both fuel sod peat as well as sod and milled horticultural peat. Only an estimated 15% of the fuel peat is traded and the bulk of the horticultural peat from these sources is supplied to the larger companies. The annual average production of horticultural peat from Irish bogs today is estimated at 2.5 million cubic metres. 90% of this is exported, principally to Belgium, Netherlands, Luxembourg, Britain, France and Italy (Fitzgerald and Byrne, 2007). Large scale industrial and agricultural activities are licensed by the EPA under Integrated Pollution Prevention Control (IPPC) licensing. IPPC licenses aim to prevent or reduce emissions to air, water and land, reduce waste and use energy/resources efficiently. Under IPPC licensing a restoration plan must be drawn up and implemented for the industrial peat extraction site. At present Bord na Móna are the only moss peat company in Ireland which holds an IPPC license. According to Byrne (2008) peat is an essential raw material in modern horticulture. This is also the view of the European Peat and Growing Media Association (EPAGMA), which was founded in 2004. EPAGMA’s main objective is to ensure that peat becomes highly accepted as a growing medium and energy provider within the EU. At present, within the EU, peat is excluded from the Eco-label for growing media and soil improvers, and is not regarded as a renewable energy source. Due to public concern over the adverse impact that peat extraction causes to peatland biodiversity, producers of growing media are being forced to reduce the use of peat in horticulture by searching for alternatives to peat (Perneel et al, 2008). The UK is a major importer of Irish moss peat, with Ireland supplying over 50% of all moss peat used in the UK. The UK Biodiversity Action Plan (1999) sets an ambitious target for the use of moss peat alternatives to rise to 90% by 2010. Many alternatives to peat have been evaluated and incorporated into growing media in recent years, such as bark (pine and spruce/larch mixes), wood fibre, coir and specifically selected composted green wastes, but for many commercial growers, peat remains the raw material of choice (Byrne, 2008). Reasons for this may include the poor alternatives to peat first used in the late 1980s / early 1990s, a fear of poor traceability and risk to operators from the use of new materials; lack of consistency in the composted alternatives; fear of contamination with weed seeds and financial costs of developing mixes with new materials and changing nursery practices (Anonymous, 2008b). IPCC have been campaigning together with NGOs in the UK Peatlands Campaign Consortium to promote the recycling of organic waste and the use of peat free products through an outreach education programme entitled Growing Wiser Wildlife Gardening. Our campaign, targeted at gardeners and community groups, has motivated them to set up individual and community based composting schemes. To this end we have published a Guide to Community Composting (Foss & Rice 1997) and have provided Internet resources on this topic (www.ipcc.ie). Local Authorities help promote the recycling of organic waste as part of the National Reduce, Reuse, Recycle campaign.